★This application is currently in Chinese, with Chinese narration and Chinese Words★ More Languages are coming shortly. 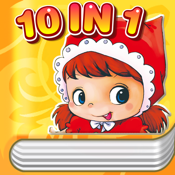 Your child will learn while they are playing, Children's Favorite Stories 10 in 1 has 10 beautifully illustrated classic children's stories which will keep child entertained for hours. Illustrated and Narrated beautifully to keep your child entertained while they read 10 much loved classic Stories. The stories have karaoke style texts, so you child can recognize the words while enjoying the stories. Easy to change between Traditional, Simplified and Pinyin. ★This application contains 10 classic stories. ★These simple and classic Stories are interesting and great for your children to learn. ★The application has 3 different reading styles depending on the age of your child. Super Songs 1, 2 & 3, Study Pin Yin, Everyday English 1 & 2, 100 Tang Dynasty Chinese Poems for Children, Baby’s First Vocabulary 600 + 100. Don't wait, start reading and playing with Children's Favorite Stories 10 in 1 now.